How To Start An Import Business In Nigeria With N10,000 Or Less! 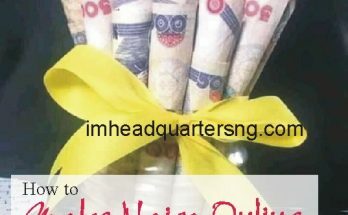 …And Earn N250,000 Monthly From Home Right Here in Nigeria GUARANTEED! This article will show you how to start a mini importation business in Nigeria with N10,000 or less and earn N250,000 or even more on a monthly basis right here in Nigeria GUARANTEED! Perhaps you have been searching on Google and even Nairaland on the most profitable importation business in Nigeria to start as quickly as possible. If so, today is your lucky day. You are about to discover how to start an import business in Nigeria with very little capital and smile to the bank on a daily basis. Is Importing From China Better Than Buying From Lagos? How To Make Profit From Online Importation In Poor Economy? What are the Top 10 Website To Start Your Online Importation Business? You have likely asked the same questions too. But, let me assure you that the answers to all your questions regarding the online mini importation business in Nigeria is right here on our website. Our mini importation business guide pdf will reveal the answers to the above questions and a whole lot more. As a matter of fact, we will show you how to import goods from china to Nigeria using cheap importation secrets. Armed with the Mini Importation Business Guide, you will discover how to import goods online from mini importation websites and get them delivered straight to your shipping address right here in Nigeria – either your home or office address, which you indicate on the order form on the mini importation websites. Here is how to start a mini importation business in Nigeria. products at the cheapest prices that you can find anywhere on the internet. Warning: You need to be careful and exercise the utmost caution as you do your research on the internet. This is because 99% of business opportunities on the internet are outright scams. So, you have to be sure that you do not transact business with dubious companies that are engaged in online scam on the internet. find out if the company offer a money-back guarantee or buyer protection policy with the products that they sell. of the common payment instruments are MasterCard, Visa Card, Payza (previously Alert Pay) and the UBA AfriCard. which you have researched in step two above. Fill in your information, including your shipping address (where you want to receive delivery of your products) into the order form. Ensure that the address which you use for the shipping is easily traceable and reachable. Thereafter, click on the order button and await the delivery of your products at the address that you have indicated on the order form. Step Five: Market your products to your friends, colleagues, neighbors and relatives in your neighborhood. you deal in top quality products at rock bottom prices cheaper than even those in the open market. And before you know it, the word will quickly go viral and you will start getting more orders than you can cater for – right from the comfort of your own home! Click HERE to Get Started Without Delay! To tell you the truth, the whole process of importing products online and having them delivered to your doorsteps right here in Nigeria (as we have described them on this page) is far from being an easy one. As you may already figure out, there are challenges that you must overcome in the process. Hence, knowing how to overcome these challenges to the importation business is very crucial to becoming an effective and successful mini importer in Nigeria. But, these challenges are closely-guarded secrets of mini importation not easily found on Google or the internet as a whole. Nevertheless, you must be acquainted with these mini importation secrets before you can hope to succeed with your mini importation business. In the first place, in order to be able to successfully import products on the internet, you need to be able to differentiate between companies that engage in complete scam online from respectable, genuine and serious business organizations. That in itself is not an easy feat – because, like I mentioned earlier, 99% of business opportunities on the internet are outright scam. Hence, some of those companies can simply take your money and fail to deliver the products that you have ordered to you. Those of them who will manage to deliver the products to you will supply substandard products. To make matters worse, since they do not have a buyer protection policy in place, you have no where to go to to seek redress. Similarly, how do you overcome the problem of the type of payment instrument to use to make payments for the products since they are quoted in dollars? If you decide to use a MasterCard – a popular payment instrument on the internet – how do you obtain one with ease to make payments for the products of your choice? Finally, how do you get the best bargain on your purchases, and how do you open a dispute and get your money back, if all fails to go according to plan? Therefore, it is pretty obvious from the foregoing that the mini importation business is not an easy one to begin – to the unguided first-timer. Without a workable plan and a thorough consideration of the important areas enumerated above, you cannot hope to start and successfully operate a profitable mini importation business. BUT, what if I should give you assistance with handling any of the required steps above for successfully importing products online, would you appreciate it? I am sure you would. However, I will do better than that. I will provide you with information on how to go about completing four out of the five steps enumerated above. Unbelievable? But, that is precisely what I have offered to do for you! 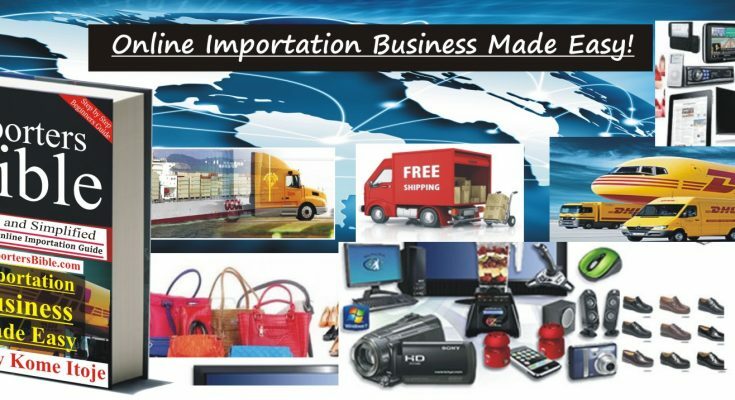 Here comes the perfect guide on the online mini importation business in Nigeria. It is an e-book titled: “The Importers Bible”, written and published by Kome Itoje. Frankly speaking, “The Importers Bible”, previously known as “The Mini Importers Companion (Where and How to Get Brand New Laptops, Androids, Blackberries and Other Top Quality Products at Rock Bottom Prices! )” is a step by step guide which provides you with all the information you need on the online mini importation business in Nigeria. Additionally, you will also learn on how to complete 4 out of the 5 steps enumerated above regarding setting up a profitable importation business in Nigeria. To this end, this new wonderful e-book reveals another top paying home business opportunity for you to make money with ease from the comfort of your own home right here in Nigeria. Jokes apart, “The Importers Bible“ – the only complete authoritative online mini importation business guide in Nigeria – focuses 100% on helping you, the highly motivated internet marketing enthusiast on starting a very lucrative home based business based on this hottest home business idea! As a matter of fact, “The Importers Bible” will reveal to you how to start an import business in Nigeria from home. With as little as N10,000, you can order cheapest brand new laptops, androids, blackberries and other products with free shipping and make as much as N250,000 in less than 30 days guaranteed! Everything you need is explained in the book in explicit detail. “The Importers Bible” will show you all you need to start importation business in Nigeria. You will learn how small scale businessmen and entrepreneurs in Africa can become part of the import business with little capital investment. Honestly speaking, with the knowledge contained in “The Importers Bible”, you too can import products at low wholesale prices and sell them for a much higher profit. Are you an unemployed graduate or school leaver who is fervently searching for a job? If so, stop searching for those non-existent jobs! 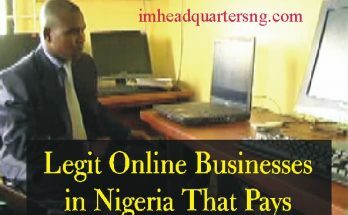 Start an import business in Nigeria today and earn over N250,000 Every Month for LIFE! Believe me. The online mini importation business is one of the very few among the list of online businesses in Nigeria which you can start very quickly with little capital and start to earn a monthly income without any delay. As a student, you will be able to find an alternative source of income to see yourself through your higher education without depending fully on your parents or guardians. On the other hand, this is equally the best home business for a stay-at-home moms and housewives. You can easily use the income realized from the business to support your husband on the home front. Indeed, with proper guidance, starting importation business here in Nigeria is not such a difficult thing to achieve. You will discover the top ten fast selling mini importation products that you can import from China to Nigeria to make instant profit for yourself. Start your mini importation business. These products are hot-in-demand and sell extremely fast in Nigeria and at high profit margin. For instance, furniture business in Nigeria is big business. But, come to think of it. What if you can import furniture online cheaper than their prices locally and of better quality? Made in China furniture is one of the fast selling products you can import from China to Nigeria and sell at over 300% profit to people in your area. And people will be queuing up to buy the products from you, once others become aware that you deal in top quality products of better quality than those in the regular market. Honestly, you will be making so much money that folks in your neighborhood will even start thinking that you have gone to do blood money (or “oseigho” (in my local language). “The Importers Bible” will show you three different ways to raise capital for your online mini importation business. As a matter of fact, “The Importers Bible” takes the lid off some of the most respectable companies on the internet where you will find the cheapest androids, lowest priced blackberries, mobile phones and other top quality products at rock bottom prices. Quite frankly, the e-book pulls no punches, holds nothing back. Filled with easy-to-understand pictorial illustration, it leads you step by step, strategy by strategy through a flawless learning process. NO STONE IS LEFT UNTURNED! Yes, indeed! This wonderful new e-book explains it all. Matter of fact, if you read only one e-book on “Best Strategies On Spending Less To Get More” this year, make sure that it is this e-book: “The Importers Bible” – the only authoritative online mini importation business guide in Nigeria. But, do not just take my word for it. Check out what people are saying about “The Importers Bible” below. “The Importers Bible” is indeed a formidable tool with which one can make a lot of cash this year. Before I ordered “The Importers Bible”, I knew next to nothing regarding the online mini importation business. Now, I am importing various products from China like a big-time importer. All thanks to “The Importers Bible”. He continues: “My New Year Resolution is that I will embark on Mini importation of cell phones and its accessories plus wristwatches. I will love you to be my mentor especially in product search for cheap and quality product. Will you accept? Thanks.” – ELECHI FELIX at Ikorodu Lagos. Do you need to be an internet guru in order to be able to order and purchase different products from these websites? All you need to do is to simply follow the step-by-step process explained in detail in “The Importers Bible” and within a short time you will be ordering different products online and receiving them at your residential / shipping address like a big time “importer/ exporter/ general merchandise, echeteram, echeteram” business tycoon! Without a doubt, this e-book, “The Mini Importers Companion (Where and How to Get Brand New Laptops, Androids, Blackberries and Other Top Quality Products at Rock Bottom Prices! )“ will open up a viable home business opportunity for you – and your life will certainly never remain the same again. 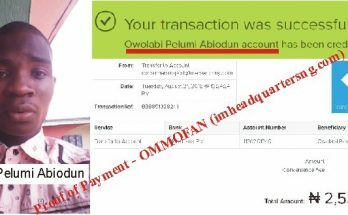 Avoid Falling Victim to Online Scam! Consult “The Importers Bible” by Kome Itoje for Proper Guidance and Assistance. Click HERE to ORDER The Importers Bible and Learn EVERYTHING About How to Start a Profitable Online Mini Importation Business Without Delay!